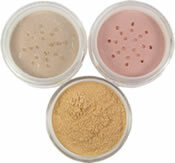 Transform dull flat skin with a shimmering new Illuminating Dusts from Buff'd Cosmetics! Available in a collection of naturally soft shades, Buff'd Illuminating Dust can be applied as a highlighter to your cheeks or to your entire face giving skin a warm healthy sheen. Illuminating Dusts can be worn alone or in combination with any of our mineral products. Our Fall Color Collection Has Arrived! Our Fall Color Collection is now available for a limited time only. A collection of three coordinating eye shadow shades in this seasons trendy warm earth tones. Hearth - murky brown with soft golden green shimmer. For those frightening witches costumes we formulated Gruesome Green Mineral Foundation. Made from the same minerals as our regular foundations, Gruesome Green goes on a thick vibrant green but feels like wearing nothing at all! Our Death Becomes You foundation is perfect for those costumes where only the sickliest and hollow complexions will do! Together with our Ghostly White foundation we will make even the healthiest skin appear pale and sickly! And of course, no costume would be complete without our Bloodcurdling Black lipstick - formulated with all the same natural ingredients as our other mineral lipsticks.